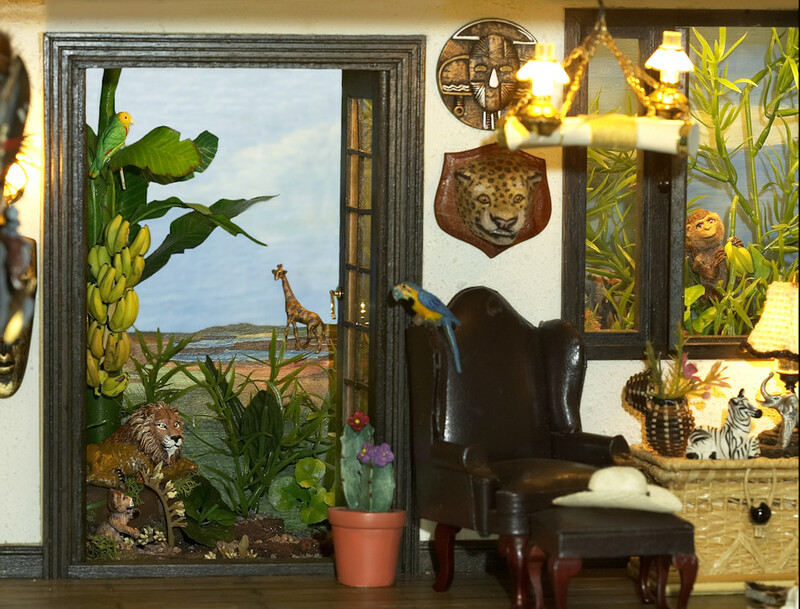 Wren Song Miniatures offers unique 1/12 designs for your dollhouse, roomboxes and miniature scenes, including miniature tables, lamps, chandeliers, miniature floral arrangements and dollhouse accessories. Our designs will help you to create imaginative settings for a wide range of miniature décor including Victorian parlors, simple country kitchens, miniature cabins or lodges, African plantation parlors and much more. 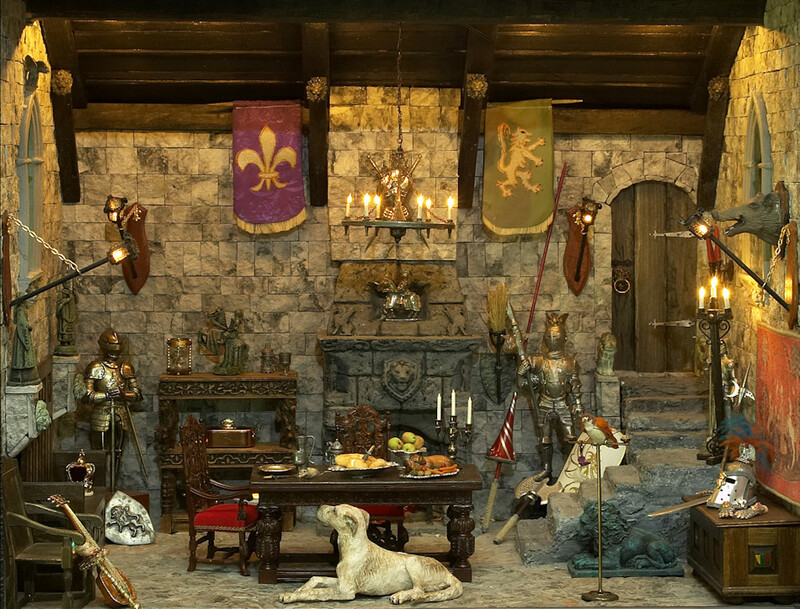 Interior decorating, whether it be our own living spaces or our fantasy miniature rooms, is all about imagination and adding interesting accessories and accent pieces. 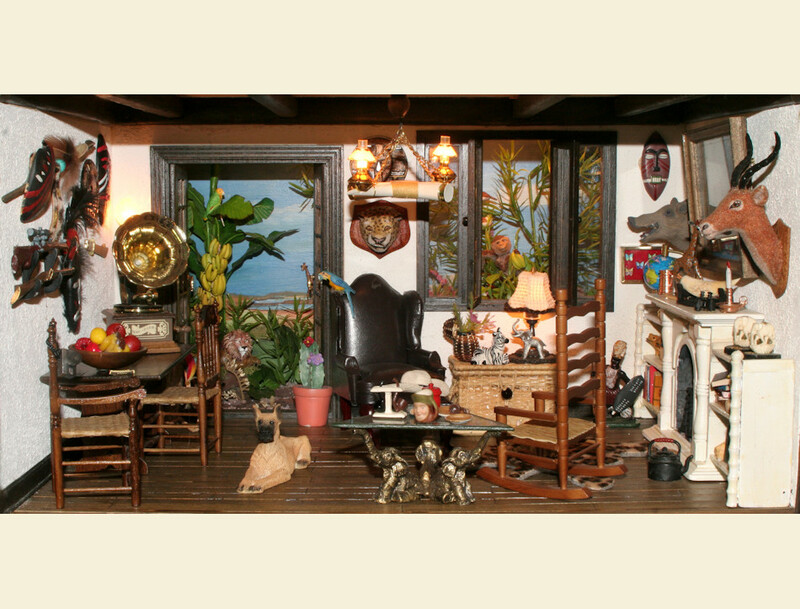 This attention to detail can bring life and warmth to miniature rooms. That's why when we design a piece of miniature furniture we never leave you wondering what would "go with" the item. We always design a miniature lamp, mirror; miniature framed print or miniature floral arrangement that will compliment the particular piece. As an example, to compliment an aged country kitchen table, our miniature country accessories include kerosene lamps, red apples in a wooden bowl, a wooden bucket of sunflowers and cattails, a framed country print or a clay pot of red geraniums to complete the setting. Our embellished marble top gold Victorian tables and matching mirrors make a delightful accent to a room of period furniture. Choose from our Victorian dollhouse miniatures and add a pair of crystal candlesticks and floral centerpiece bowl or a pair of graceful buffet lamps and you will have a lovely focal point in your room. 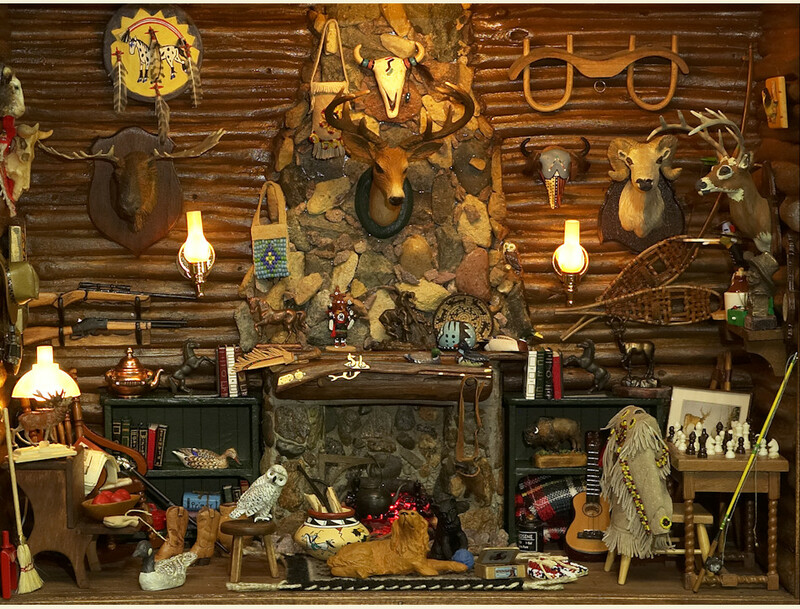 Decorating a miniature cabin or lodge room? 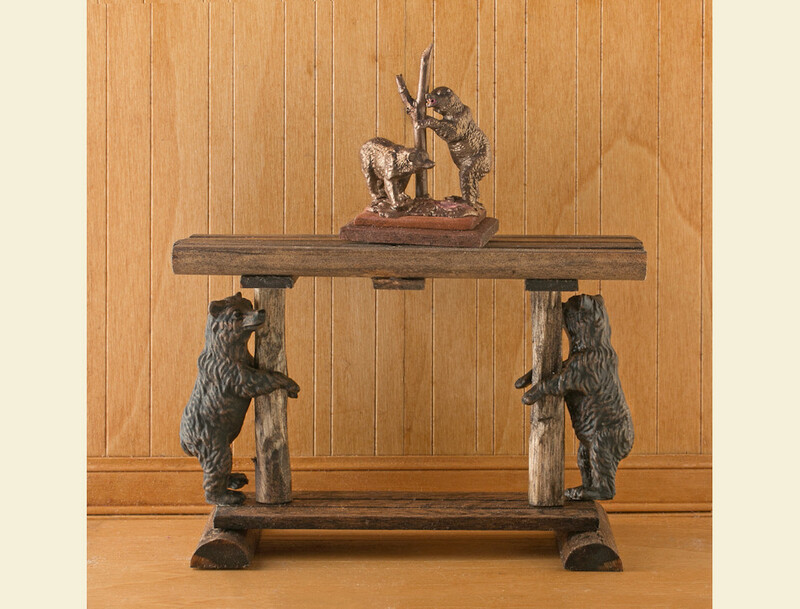 Add a miniature lamp featuring deer, moose or bear and a framed wildlife print to one of our rustic cabin tables. To complete a western theme you could select a hand painted Native American miniature deer hide story robe or a water jug filled with prairie grasses and simple wildflowers. 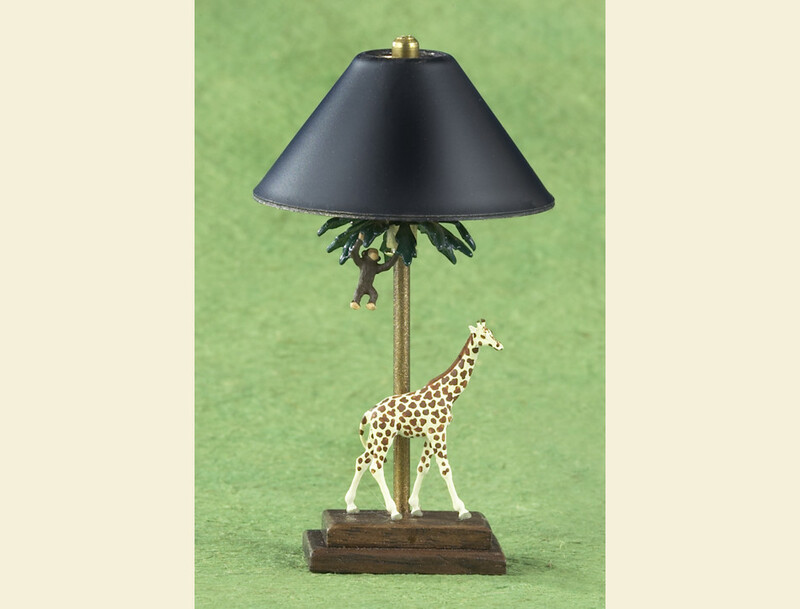 For the really unusual, we have created miniature tables featuring African wildlife accents, and African miniature framed prints of elephants, giraffes and other African critters, picture mirrors and miniature lamps featuring African animals. You could imagine that this setting could be an African Coffee Plantation parlor! If your African miniature room reflects the Sahara desert we have miniature camel prints and camel lamps! If your taste runs to Oriental miniatures, there are black temple tables, graceful miniature oriental floral arrangements and framed prints. 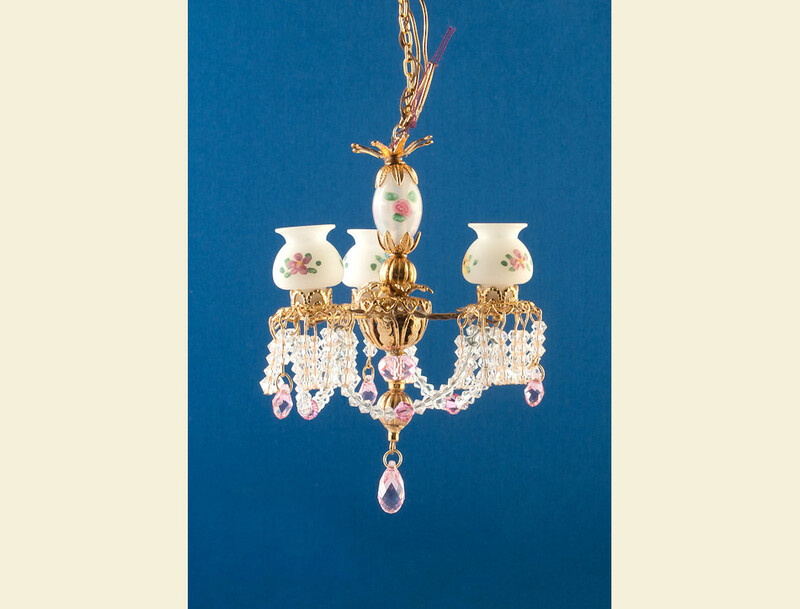 To top it all off, our miniature chandeliers range from elegant crystal, Victorian Parlor and some reminiscent of the Meissen rose designs found in European castles. 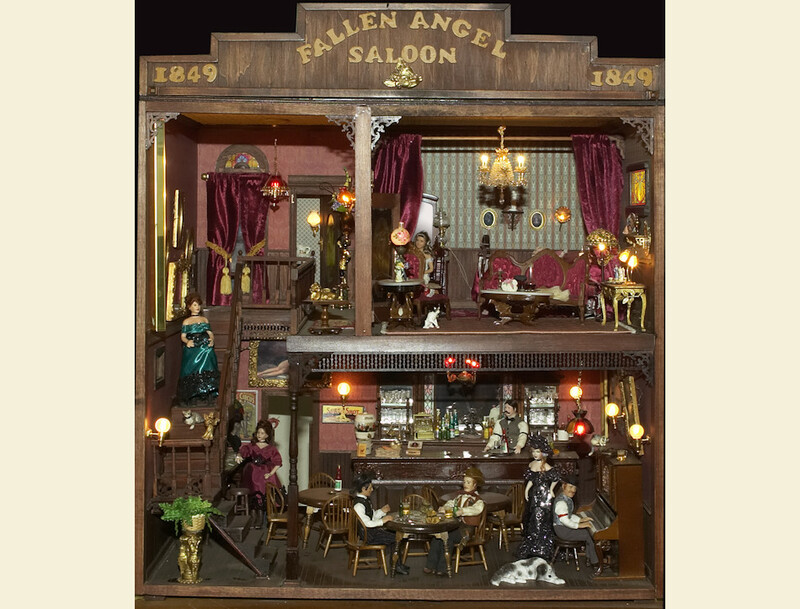 All of our miniatures are 1/12 scale and are designed and handmade in our shop. As is usual with handmade items there are few exact duplicates. The items you select will more than likely be made just for your order. The items in our catalog are probably the only one in stock. When you order, the item will be made according to the picture in our catalog. It should take about three weeks for your item to be made to your order. I hope you enjoy browsing through our catalog!